CD review: "Off Yonder Wall""
Blues impresario Robert Palmer (as opposed to bland soft rocker Robert Palmer) has lately made his mission in life the exposure of contemporary Delta blues. He haunts the juke joints of Mississippi looking for undiscovered talent still plying the same circuit were the music was born at the turn of the century. Peter Lee, former editor of Living Blues magazine, founded Fat Possum Records a few years back in pursuit of the same goal, and Palmer has produced all or nearly all of Fat Possum's releases (Lee is no longer active with the label). The Fat Possum catalog is, to be honest, uneven. Some of what has been issued has been more curiosity than top-flight musicianship. That cannot be said of the label's latest release, "Off Yonder Wall." The three men who comprise the Jelly Roll King are all longtime stars of the blues world, men who have recorded for labels like Flying Fish and Earwig. So if Big Jack Johnson, Frank Frost and Sam Carr get a little rawer on this release, you know it's by design. And this album IS raw; Johnson's electric guitar is distorted almost to the point of distraction. Carr sets a frantic beat on drums, driving the music, driving it. And Frost's harmonica and vocals have the nasty edge of a rain-rusted barbwire fence. The songs are pretty evenly mixed between originals by the band members and covers of stalwarts like "That's Alright Mama" (made a hit by Elvis), "Baby Please Don't Go" and "Sitting on Top of The World." Still, odds are you've never heard the songs played with quite this intensity. 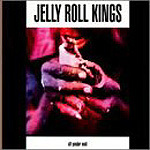 Unlike a lot of all-star combos, the Jelly Roll Kings never let up or rest on reputation; this entire CD just rips  these guys sweat for every penny you'll plop down for their album.